This week, I’ve spent a lot of time (a LOT of time) getting my workroom cleaned up and organized, in anticipation of two things: 1. several Big Projects coming up; and 2. that glorious time of year called Summer, which is when I get most of my needlework-work and major blog work done. Between cleaning up the Disaster Zone that’s my workroom and an Incident with a Needle, I’ve learned again (for the umpteenth million time) one of Life’s Most Valuable Lessons. Needles embedded in the arm of a sofa have an uncanny way of embedding themselves in my arm, too, and this little fellow is no exception. Unlike previous encounters between arm and needle, this recent meeting was vicious and mean. I’d take a photo to prove it, but that would be like trying to put my elbow in my ear. You’ll just have to trust me on this one! I’d love to post a “before” photo of Ye Olde Messy Workroom, but in fact, I didn’t even think to take one. And while I’m all for humility and all that, I don’t think my self-esteem would stand up to displaying the mess! After half a semester of school and lots of “rush jobs” to take photos and write for the website, my workroom was a Royal Wreck! But the majority of the clean up was simply putting things away. It took me hours and hours – of rearranging, reorganizing, shifting supplies, sorting books and magazines to make space, and on and on. But really, it was just Putting Stuff Away! For a couple weeks, the job has been hanging over my head, kind of like a looming mountain that I was loathe to scale. But finally, I did. And I am so much happier now that everything is cleaned up and put away! Now that things are in order, I’m able to get down to some serious needlework and blog preparations and to accomplish a lot more than usual, in a lot less time. I can’t help asking myself how much more I could have accomplished in the last month, if I had put things away after using them? And my forearm would not be suffering, either! 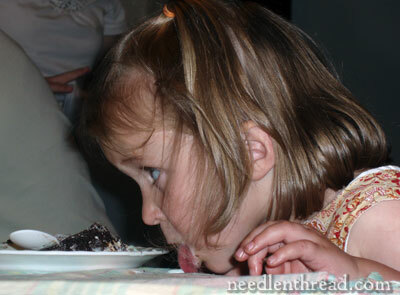 I also learned a little secret that my niece has already figured out: Cleaning up a mess – whether it’s birthday cake & ice cream, or a workroom – is not always a bad thing! Sometimes, you just have to do whatever it takes to get the job done. What about you? Are you organized and meticulous in your needlework habits? How do you cope with a clean up job when you can’t avoid it any longer? Any big secrets to your organization? In chatting with other needleworkers, I find that organization is a common subject – so we can all benefit from each other’s experience! Feel free to leave a comment and share any advice or ideas you have on keeping your needlework supplies tidy! I am sorry about your arm, you know I keep everything in baskets and inside the baskets I have those little plastic bins that stack up and that’s where I keep my threads and needles and any small supplies prone to disappear if not kept in a small place, the hoops, frames and fabrics go in the bigger baskets. I usually take the time to get the thread I need and re-braid the skein, and I pin the thread and needle I am currently using to the fabric of the project they are from. I am far from organized, but that works for me. I am not a particularly messy person. I keep most of my supplies in those cardboard gift boxes in various sizes. I label the box with the contents particularly type of thread etc. Some of my boxes have miscellaneous bits and pieces. I keep them on a cane bookshelf and they are easily located, shifted around or added to. I also have a few plastic draw sets also labelled for other bits and pieces. They are see through so I can easily find what I want. I also use the draws to hold the threads for a current project if I am only working at home. I suppose I have to be reasonably tidy because my home and therefore my workspace is not very big. Your needles do look scary!!!!!! My mom would cut a small piece of fabric she was working on and pin all the needles into it.Between work, the fabric, box containing threads or skeins or wool or whatever that was needed, would go into a polythene bag and into a drawer. often the lowermost shelf of our cupboard had unfinished work and a note on skein number so and so needs refill, or the design to be altered etc.. That way she is very organised!!! PS: I forgot to add: I have a horror of losing a needle and someone finding it the hard way ever since my niece had to have surgery to remove the broken-off tip of a needle from her foot (and no, I wasn’t responsible for the lost needle). When I lose track of a needle, everything stops until it is found. Janet. 2)I keep a tiny wastebasket on top of my machine, because I hate those snips of thread that happen while working. 3)Books are always returned to bookshelf unit immediately, which is a lifelong habit and helps immensely. 4)I keep a box on bottom of shelf to hold loose papers that need filing. When I have things that need doing I just have to start them without thinking about it and it usually doesn’t take half as long as I was dreading – so my lesson was don’t think ahead just do! Your niece is beautiful! I feel your pain with using the arm of the sofa for a pin cushion! I still do it and I have a baby, talk about a no-no! I also use the front area of the shoulder of my shirt – but rarely these days! I don’t have nearly the stash that you have but, what I do is wind my floss on the little cards and keep them in organizer boxes. Then I keep all the pieces for each project in a large freezer bag. I only allow myself to have a few downstairs with me at a time. the rest stay out of site in a large tote box in the spare room. Cleaning out that room is a challenge! It gets pushed to the side because there are so many more visible jobs that require attention. Enjoy your school vacation! Doesn’t a neat clean space calm you and take away that dreaded “I have to fix it or I can’t enjoy sewing” feeling? Heather – yes, it’s a great feeling! And Nicky – you’re exactly right! Oh, I forgot I tape a plastic bag to anything near by and I fill that with my little thread snippets. Ouch! Hope you are healing nicely Mary. I am in the mist of reorganizing my sewing room. Why? Cause my fat cat decided to use it as his liter box. So carpet is ripped out and replaced with laminate. Unfortunately I have learned that my cat is not discriminate to laminate either…ugh! To vet we go this morn. It’s either a bladder infection or a cat going bye bye. Want to know the turnout? As for needle parking, I tend to stick mine in the fabric of my pants or my top. I have a leather chair so I won’t be sticking it there. I’ve never been stuck by my needle but I have gone to bed with my needle neatly parked on the thigh portion of my jammies. Strangely enough, no mishaps in the middle of the night. I have a box with fabrics in the closet, and several plastic drawers with threads. They are kind of organized by type – cotton floss, cotton perle, metalics each in their own drawer. But each drawer is a jumble. 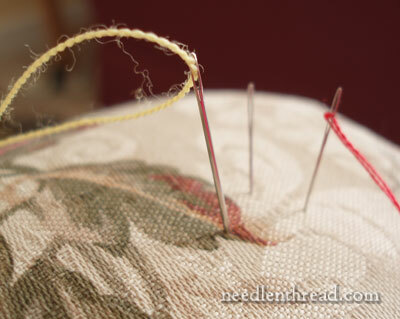 After the DH stepped on a needle that I had lost track of, I quit using the furniture for a pincushion. I either keep a small pincushion in the project kit, or run the needle through the fabric at the edge. I also need to keep them out of reach of the kitties. Ack! where’s my manners this morning – I hope your arm feels better and is healed soon! Since my Adult son and grandson moved in, my needlework and supplies are spread out in the corner of three rooms and the new shelving in the garage. So I plan a family dinner once a month that forces me to clean off the dining room table and put everything away. I definitely need modivation. Mary, How awful and startling to get stuck in the arm. I usually put my work in a clean pillow case and somehow a needle detached from the magnet made it through the wash only to make it to my bed pillow….surprised by a needle prick to my back has given me new respect for that particular stitching tool. good luck on the mend. Mary, I have a “rule” that I try to adhere to & that is to clean up my sewing room after the completion of each project. The word “rule” is loosely used as I hate starting a new project in a mess. The same thing happens in my kitchen. Go figure. I am a perfectionist of sorts and can drive myself crazy! I keep a pin cushion that I made for my Mother, near my chair and keep my embroidery needles in it. As for being organized? Ha!! I am one of the most disorganized people ever! I do need to get my craft room more organized. Seriously, when I can’t avoid it any longer, I have trouble getting back OUT of meticulous organization mode into creative again. Because when I do, organization flies right back out the window and it’s all to do over again…. I’m terrible with keeping my space tidy! I don’t have a workroom so I tend to spill over everywhere. I do have shelves and boxes to store my needlework supplies but everything that I’m working on gets stacked at the end of the desk. I park my needles into a piece of felt on my table where I work but my husband has learned that if I say “uh oh” it means that I’ve lost one. Hi Mary and Mary’s fans! I try to organize after finishing a big project. While I am working, things get disorganized but I find I work better that way. When finishing something, I need to clean up and put stuff away to start over again! Lost needles = one of my biggest fears! Now that my kids are grown, I worry about my four-legged, furry “children” stepping on or sitting on them. I park them in a pin cushion but when they get lost, the magnet comes out to find them. I stitch in bed while watching tv sometimes and hate loosing a needle because then I lose sleep lol! Hi Mary–so sorry to hear about your arm–it sounds painful! I’m glad it’s healing. Here’s what I’ve learned about my stitching room in recent years. I keep it purposefully on the messy side, because I think it keeps me from buying too much needlework stuff I don’t need. I believe that “everything in its place” does have its place, but in my case, when things are neat and tidy, I think that I have lots of room to store more stuff, so I go out and buy more stuff–most of which I don’t need and couldn’t finish even with four or five lifetimes. So for me, seeing things a bit messy is a good reminder that I have plenty of stuff to stitch and that I really don’t need that pattern/kit/book/magazine with the cute thing that I might stitch 20 years from now. Fortunately, I’m blessed with a pretty good memory of what I have, so I don’t have a lot of duplicates of things. I think in the 30 years I’ve been stitching, I’ve bought seconds of only three things (not counting threads, which I know I’ll use anyway). But I’m glad that your stitching room is clean and tidy for you, so that it makes you more productive. I have a small chest that has lift out “drawers” that hold all my accessories from fabric erasers all the way to my fabric scissors. That holds up (3) 3″ binders of DMC floss in the stitch bow system that is backed by my sewing machine cabinet. Under the little table that those sit on is a box just big enough to hold “will get to eventually” projects. When you do a 180 deg. turn you would be right at my craft desk. That holds divided bins for ribbon (floral type), then my little metal office cube with drawers for smaller items like thimbles and applique pins. The top has my hand sanitizer, lotion and the shelf under those holds sticky notes and recipe cards for notes/thread holders, then my small collection of embroidery books and another chest with drawers and a lid. That chest holds my DMC Medici that is left and the remaining of my DMC Floss (variegated, light effects, satin and linen). Even though I am usually a very organized person and I own practically every type of pincushion, needle case and needle holder, I must confess that I, too, stick my needles in furniture. Until your post, I thought I was the only person in the world who had this habit! When I was a teenager, my poor father would get up early for work and sit in his favorite chair only to be stuck in the elbow with an assortment of embroidery needles. Now that I am married, I must confess that I have now done the same thing to my poor husband! To prevent any further human or upholstery damage, I am now using a kind of arm cover/ needle roll that I made that includes a sand filled pincushion. The weight of the pincushion keeps it in place on the arm of the chair and I can simply roll up the entire thing at the end of the day and slip it into a bag or basket. Thanks, as always, for your wonderful blog! Mary, sorry to hear about your mishap with the needle. Your little niece is just adorable. I think the way to keep organized is to have a plan. That is where a professional organizer could help. Perhaps you could offer to trade a few lessons with someone who does this for a living. Once she shows you the tricks of the trade, I’ll bet keeping your room tidy and organized would be a snap. Hi Mary I hope your arm is healing. I know about messes I just moved from a 4 bedroom home to a 2 bedroom mobile home. I had a huge estate sale to sell my collections and extra furniture I could not bring with me. Until yesterday you could not see my sewing room, but today it is looking good. I have book shelves across one long wall that hold my sewing books all in alphabetical order so they can be found quickly. When sewing I always have a long decorated pincushion on the table and my needles and pins always go into it. I change the needles for the project I am working on and put the others away. Not that I am organized because I make huge messes when working on a project and then when done I have to clean all over again. Mary as I am doing aproject everything is a mess. I have learned to clean up as each project gets done. Are you kidding! If you saw my office and/or sewing room…you’d know I am NOT one to offer advice about organization or cleaning up after myself! However, I’ll be reading all the ideas posted by others…and hoping that something will rub off on me! Mary, I bet my room beats yours. I moved my sewing room after some remodeling last summer. But before I could get my things even close to unpacked and organized my daughter announced that she was getting married this summer and she wanted me to make her elaboratly beaded wedding gown. I put everything on hold to start this dress. It has now been 9 months and I am ALMOST finished with the dress. My sewing room looks worse than I ever thought possible (I don’t even have the curtains up) and I don’t know where to start to get it in order. It is almost overwhelming. But I keep thinking -one box at a time, one drawer at a time. Can’t wait to get it straight. I finally got a handle on my portable sewing – those are the projects where needles are put everywhere and lost. A deep cookie tin houses my portable projects with scissors, thread, needlecase etc. I had a small pin cushion that kept floating around in the tin but it wasn’t stable or convenient. Solution: I sewed a “pocket” on the bottom of the cushion, inserted a strong (round) magnet and stitched it up. Now the pin cushion stays attached to the lid of my tin and is stable for corralling my needles. At the end of February and beginning of March I got the “itch” to clean up the fabric shelves in my studio. I worked and worked and worked until when looking at the result I could not believe it was my studio! The feeling of satisfaction that I get every time I have to go into the shelves to get a piece of fabric for a quilt is unbelievable. Unfortunately, there is also a downside to this adventure: there are some fabrics I just know I had but which are nowhere to be found! Could I have given them away? I’ll never know…. Am I a bad person for taking a perverse pleasure in the fact that someone as “together” as you are, has the same struggle with disorganization? I hope I live long enough to get my workroom shipshape again…. I’m like you and have a huge creative mess going right now and its driving me crazy but before I can tidy up I have to finish the project which I’m real close to doing. (this weekend) I try real hard to not let things get out of hand but life happens! I like the idea of 15 minutes of clean up a day! Mary your neice is such a cute little doll! I don’t have much to suggest for organizing. I keep changing how I do it, but everytime I start a project, everything ends up a mess. I come to a point where it takes longer to find things than it does to use them. Then I just stop and put it all back in order. I really envy those who are disciplined enough to stay organized. My workroom is usually organized chaos. As I do a little of everything–sewing, knitting, crocheting, embroidery and several other non needlework crafts, I am always looking for ways to organize as well as take select projects on the road. Lately, baskets and bags have been live savers. Knowing the perils of lost needles, be it by the embroidery chair, or pins and needles by the sewing machine, I have a wonderful way of solving this problem. My late husband gave me a half piece of a magnetized metal tube about 1″ thick,which I use it to roll around the carpet or the chair or my lap to collect what ever I have accidentally flipped or dropped. I always Eric by my side. In the past, I, too, used to stick my needles into the arm of the sofa – until said sofa needed recovering. I happened to spot a needle “kind of” sticking out of the arm, so I pushed down on that arm, and about 20 needles popped up! Yikes! I’m glad I found them before the upholsterer had to! I’ve also left a couple of needles in the backs of airplane seats – they are a great place to hold them while traveling, but I’m pretty sure not so great for the plane cleaning crew. I’ve had to get really creative with my storage as we are downsizing from a big house to a small one. Hard to do! Mary, could we maybe see some pictures of your totally organized workroom. They would undoubtedly give the rest of us some ideas. Needle parking: I always have a couple of magnets on the top [and, of course, the bottom] of a project and store needles on the magnets. The magnets are also useful for ‘attaching’ the chart to the work in progress. Irene’s system: her memory must be great, how does she find the stuff after it has been stuffed. Oh my! I thought you were describing me when I was reading how you clean your sewing room. I do think I spend far more time cleaning and organizing than I do actual sewing or stitching. You are so right. If we just put things away when we are finished…..Why do we do this to ourselves? As for needles, well, mine usually fall into a black hole somewhere when I drop them and then I have to go look for more, then go buy more because I can’t find the stash I had then…..well, you see where this is going….. Whenever I clean out my workroom I cannot find anything for about a week. Organization is not my strong point. I’m kinda like Pigpen in the Peanuts cartoon — only it’s not dirt, but disarray that follows me around. Cleaning my sewing/craft area is a constant battle. I’m working on a place for everything and that is helping, but I still haven’t figured out how to remember to put things away as I work. Hi,well I spent 40 years in the fabric and craft business and I am so used to keeping things so organized that I have carried it into my now retirement. I love rearranging stuff over and over again then guess what I forgot that I had certain things. But seriously I am a organizer by choice my sewing studio is always in a rumble because I have so many projects going on. So I know where your coming from. Sometimes disorganized but were happy. And the needle thing yep it hurts. I love your news letters and all of your advice. So yes I am really overorganized,it drives my sister crazy because she is a collector. Ouch!! To look on the bright side though – at least you didn’t SIT on it!! My studio flip flops between being neat and being a complete and total demolition pit. I’m a messy creator and while I’m in the middle of a project I can’t wait to work at it and don’t take time to put things away. It’s only when the clear space on my worktable dwindles to about six inches that I realize that a clean up is in order. I try to be careful and keep track of my needles but I’m always loosing them and finding them later with my feet! Most of the time I barely feel it when I stand on them but there was a rather dreadful time that I got half a darning needle embedded in my foot. I’m not sure which was worse. Standing on it or pulling it out! I don’t stick my pins or needles into the arm of my chair any more because I found my cat pulling them out with his teeth! Been there, done that. The good thing is, you could stitch up your wound yourself! Halfway through dancing around and yelping ouch, I remember I’m a diabetic and I poke myself several times a day. My tip is I use an empty tissue box for thread snippets. That way they don’t come back to haunt you, the plastic opening is too small to have anything fall out, you can even tip it over!! I have a friend I sew with on a weekly basis named Ellen. She told me that she thought she was having a heart attack during the night because she kept getting sharp pains in her chest. Ellen was having a very difficult night because the pain would randomly come and go. She decided to get out of bed and see if walking helped relieve her pain. It was not long before she discovered that she was not having a heart attack but rather she left her needles parked over her left breast in her nightgown. She forgot all about them when she went to bed. I stopped using my furniture as a pin cushion after our dog ate five needles and attached threads! We managed to fish out three of the needles by pulling the threads but the other two… I had to closely examine his ‘you know what’ for days afterwards until they passed 🙁 we have a toddler now so i’m trying to be good and put things away as I go. Cute photo of your niece! LOL My other tip is don’t loose needles/pins in ironing board. I used to always use the ones without the glass or plastic heads and shorted out the house due to the iron cord finding said missing pin. Not a very good thing to do at all but the flash and bang is pretty impressive. Not! I don’t often leave comments on here but I love reading your blog Mary. Condolences on the needle-stick. When a needle goes missing, I work hard to find it, but am not always successful. Fortunately there haven’t been serious consequences. A telescoping rod/magnet helps, or a “cow magnet” I received as doorprize at a class. Organization. It feels like a continuous process, especially with an expanding stash. Goal is to catalog as I buy. Usually pretty good with threads; not as good with charts & fabric. Still spend time searching for projects in various boxes, crates, and totebags. Threads are put away as projects are finished. Rings by thread-type/brand work for most fibers, especially with TUX bags. DMC is on bobbins in floss boxes. I keep a pincushion handy for needles as I stitch, and use a cupholder/scrapbag holder from Creative Memories in my stitching corner. It’s been a matter of reinforcing a habit that in cooking I’ve heard referred to as “clean as you go”. Everyone works differently. Let us know what ideas sound good to you. I hope your arm is healing well. I used to park my needles in the outside edge of my stitching project, but have found a MUCH better way to keep track of them. I purchased about a dozen earth magnets from Lee Valley supply. They are very small and very strong. I use a pair (one on top and one behind the fabric) for each project I’m working on. They cling tight to the needles and they don’t mark even the daintiest of fabrics. I also use them as singles on my light arm so that I can keep extra needles handy. As for organization, I have always been a “place for everything” kind of girl and like to keep my stash that way. My workroom does double duty for all types of needlework and scrapbooking. I have put up large pieces of peg board on two of the walls and hang anything that will hang neatly (scissors, cutting mats, t-squares, etc.) The items I need most are quick to hand, and quick to put away. The rest is stored in two door cupboards in labelled baskets and boxes. Like you I too use the arm of the sofa as a pin cushion or the shirt I am wearing. So far, no hazardous situation to report. However, I always use an ortbox! The stitching room is loads of shelves and drawers and boxes etc. to keep things tidy, but…..every so often (maybe too often) the room looks like a bomb exploded and I can’t stand the mess anymore myself and have to take the time to clean up the mess. As for finding things when I am looking for them, well, that is a hit and miss thing altogether! Like I fabric that I had cut and drawn threads to make 8 blackwork coasters while I was away on a holiday. But could I find them on the evening before I left? I had to cut another piece of fabric to take with me! So much for organization! Look forward to your blog everyday. Thanks! Organization has it’s place. But I’ve found that the multiple projects left around have been very inspiration to me to finish them and design other color and technique themes. I did get around to about an 85 percent spring clean in my workroom. It’s enough to tidy the viewed area from the family room, but enough chaotic inspiration to keep the wheels turning. Books and journals are all in their proper places, and most threads, bobbins, paints, etc are back to the general areas and boxes they belong in. Now, onto finishing some! I needlework in a leather chair, so I can’t put my needles in because the leather is too sturdy XD Otherwise I’m sure I would have many accidents like the one you had! Other than that, I’m not very organized…at all.. I have to say I am a bit of a tidy freek and more or less tidy up each time I work so I am ready to start on a clean slate next time. I think you need to take out only what you will need and that saves time on putting away. I agree a place for everything and everything in its place!! Have a great easter with lots of yummy eggs! “organized confusion”. Need I say more? Would love to be better organized. Gotta go clean up my organized confusion. Got some good tips today. I tend to take one day a month to resort and put everything away. This is usually acerbated by the mess that overtakes my too small sewing room and forces me to hunt for something that got buried. I try not to get too many project going at once, but as we all know between teaching samples, and our own projects as well as the extra projects that we just buy to do later, there is a never ending pile of stuff to go through. When I get overly busy I end up mixing the hand embroidery with the machine sewing notions and then looking for a pattern among the magazines and it all turns into fruit basket upset. I then take a day to straighten it out and like you I am much happier thinking it will stay clean forever only to frustrate me when it doesn’t. hi there,first of all i would like to congratulate you for making this website,and making needlework like a fun game.thank you sooo much.i am from India,during my college days i have learnt lots of traditional embroideries,it was really fun,but our teacher,ghosh! !she used to make things so complicated and she never welcomed new ideas.You are the masiha i must say.loads of good wishes.hahaha organisation, ya my family complaints a lot that i am not at all organised,well,so try to put things back as soon as i finish with my work.but that becomes too boring over the period of time,so i kind of make pincushions and get the draw string bag which is really attractive to me,so everytime i see that i get tempted to use it.so this is one of my own way to stay little more organised. but while stitching and drafting and even while designing i get creative ideas only in messy surrounding.well that’s me!! ya i see to it that i put back all pointed objects back to its place or atleast tuck the needles safely so no one at home gets hurt because of me and also next time i get them when i need them. making your own needle book,pincushions, draw string bags, small scissor holder thumball etc would always attract you towards them n you would surely love to use your creations. Organizada en mi trabajo, noooo, cuando se tiene un proyecto en la cabeza primero trato de buscar todos los materiales necesarios para llevarlo a cabo, y después empiezas con el proyecto, estoy tan ansionsa que me olvido de organizar mi lugar de trabajo, y como tu bien dices después se acumula todo y hay que dedicar mucho tiempo a la limpieza y el orden. I “organize” when we move, by packing everything in plastic shoeboxes and throwing out any scrap I can bear to part with. This worked well for the first 15 years of marriage because we moved about every 2.5 years – no, not military; my husband just had a bad case of Wandering Foot. I have two excuses: 1. For 25 years, I’ve worked as a legal secretary, and occasionally paralegal; I’ve HAD to be ultra-organized at work because I was responsible for organizing the lawyers. That used up all available organizing ability, and 2. It’s congenital. My mother is one of the least-organized people I know; I inherited her “disability.” It’s not my fault! Ciao Maria, mi spiace per l’inconveniente con l’ago! Immagino quanto male!!! Io attacco sempre l’ago al tessuto su cui sto lavorando e sono seduta davanti ad un tavolo, perciò non ho la tentazione del bracciolo del divano….Tutti gli altri lavori, cominciati e non, sono in una borsetta di plastica, col loro tessuto e fili e schema, in attesa che io li prenda in mano. Poi li tengo o sul tavolo, a fianco al computer, dove io ricamo, oppure passano dentro il mobile dove tengo tutte le mie cose e qualche volta vado a rovistare. Mi ritengo ordinata, anche se a tempi alterni ho il tavolo sommerso. Tutto dipende dalla mia testa: se ho in mente un sacco di cose, se scrivo appunti, se faccio ordini, è tutto sul tavolo finchè non mi stanco. Poi ricomincio a mettere ordine e così via. Buona continuazione per tutti i tuoi impegni, sei bravissima, ti ammiro molto! “Do What Works For YOU”. Are you a everything in its place? Or are you a “CHUCK-IT” person? I can organize a draw with everything in pretty boxes or tins. But it won’t stay like that if you are a, “Chucker”! Here is why. For us “Chucker’s” it takes wayyy to long, to get things out and then put them back in there pretty little boxes. For us we want to open the draw, see what we need, get it and go. When we put things back we want to open the draw and “CHUCK-IT”! Chuck-back in its open, neat, little box, and be done! I use pretty boxes with no lids. There’s a box for each item in the draw. So it’s a open and “Chuck-it” in style. Now my draws stay nice a little longer. There are “Neat Draw People”. When they need something, they open the draw, get there pretty box out, open the pretty box, and get what they need, put the pretty lid back on the box and then put the pretty box back where it goes. I am a “Chucker and it’s ok.